After arriving in Belfast towards the end of their charity fundraising tour of Northern Ireland, the National Autocycle & Cyclemotor Club’s Wirral Wobblers got a nasty surprise in the shape of 17 parking tickets placed on the seats of their small machines. Ted Bemand, whose account of the tour has been appearing in recent issues of OBM, immediately phoned BBC Ulster, and within half an hour a TV crew had arrived to record the sad outcome of the Wobblers’ charitable work. The angry pensioners shuffled around, one of the group called Gaynor only just walking after a recent knee operation, and in no time at all a senior hotel manager appeared and called Ted into the office. Right: Mortified! 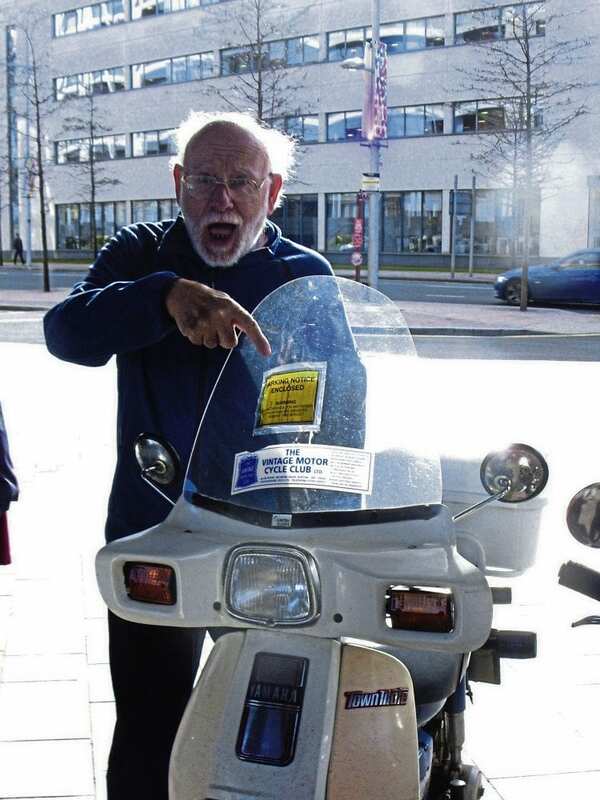 One of the Wobblers points to the parking ticket on his Yamaha Town Mate. Previous Post:Follow that coach – on a 88c James Comet!